Why? Um, because they are SO DAMN GOOD. I made up this recipe…kind of a riff on lotsa recipes I’ve heard of in passing. 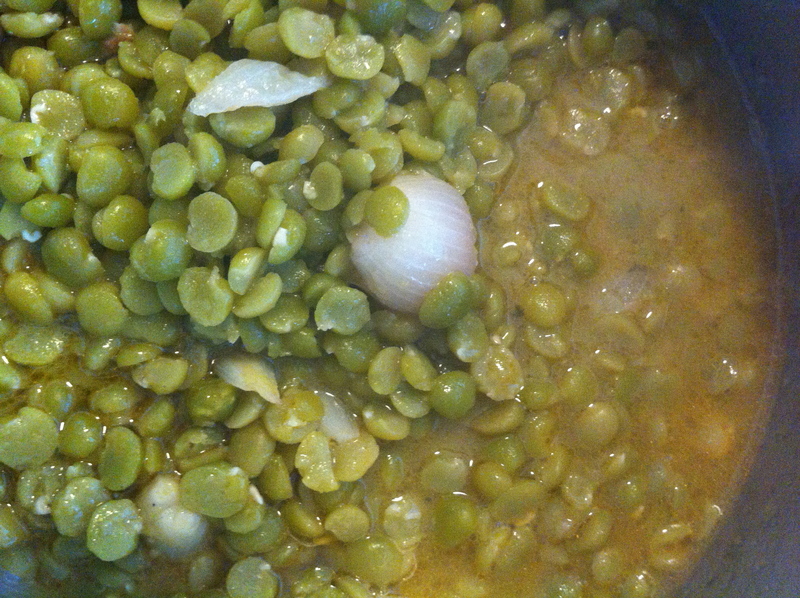 I took a handful of peeled shallots, sautéed them in a splash of Garlic Confit, added in a bag full of cleaned, washed and drained Split Peas (dry), stirred to coat, then dumped in a thingie of concentrated stock and filled the pot with water. I brought it up to a boil, then lowered it to a simmer and left it for about 30 minutes or so, stirring occasionally. I lightly salted and peppered and then…and then I tasted. I made such OOOOH-ing and AAAAAAH-ing noises that little J stomped over to the stove and demanded some too. Then we both did a Happy Dance. You can smell the steam, right? 1 tub of Concentrated Veggie Stock **I used the Knorr one from the supermarket (I had a coupon). 1- While you’re peeling the Shallots, gently heat up your Garlic Confit in a large saucepan. 2- Add in the shallots and toss to coat. Leave them sit over a gentle heat for a few minutes to get all sizzly and happy and start to caramelize. 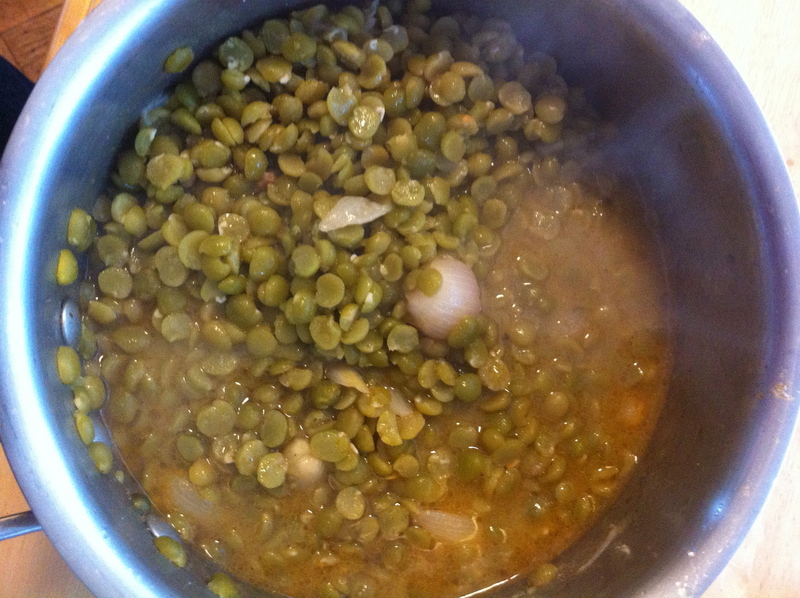 3- Add in the Split Peas and toss everything around, stirring to coat. Let them start to sauté just a touch in the confit, then plunk in the stock cube. 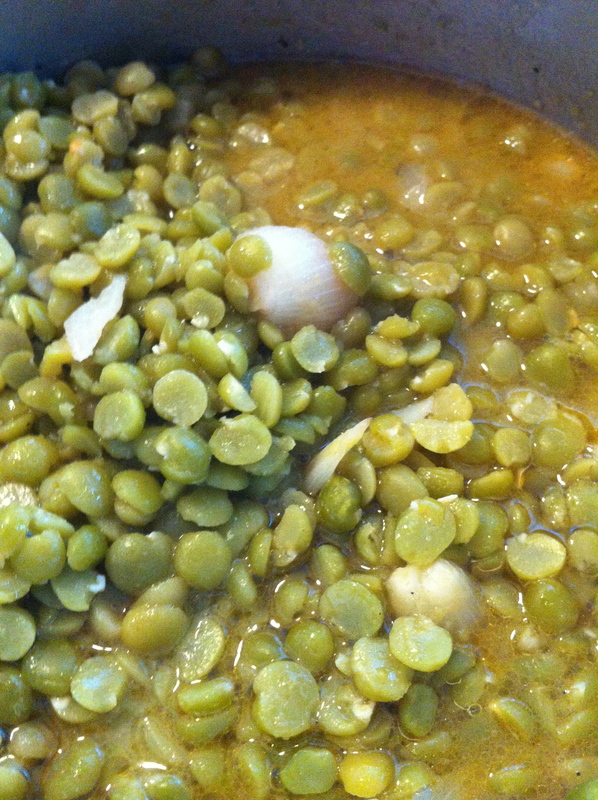 Break it up with the back of a spoon, then stir in enough water to cover the split peas. Lower the heat to a gentle simmer, partially cover with a lid (you want some steam to escape, but not all). 4- Stir occasionally, adding water to cover when needed, and keep tasting them. When they’re tender to the bite, that’s when I like them. Not mushy, but not al dente. I like them …how do you say it? DELICIOUS. THAT’S how I like them. Now it’s YOUR turn for a Happy Dance!